Miguel Vasquez, left, shoots at white-wing doves with his son Miguel Angel Vasquez Saturday at Resaca de la Palma in Brownsville. HARLINGEN — Hunting season in the Rio Grande Valley kicks off in two weeks with Special White-Winged Dove Days Sept 1-2 and Sept. 8-9. But to legally hunt those days, and to be ready for the general dove opener on Sept. 14, you’ll need a new hunting license and those go on sale today. Current hunting licenses expire at the end of this month, and new ones can be purchased at authorized dealers, online or by mail starting today. 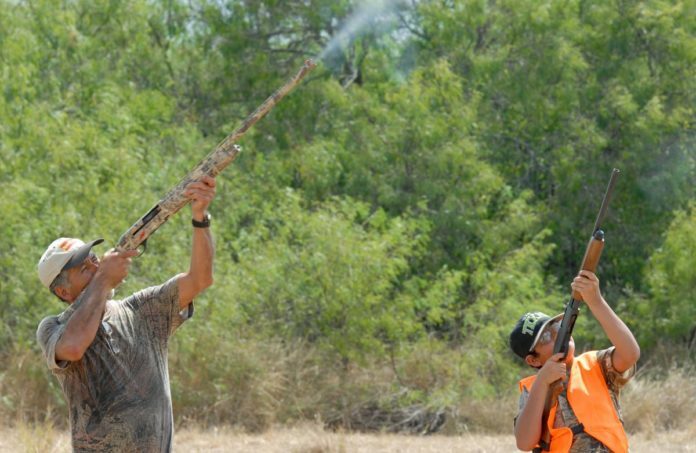 The general dove opener of Sept. 14 is the earliest opening date in South Texas since 1950. The decision is only good this year, but it coincides with the Rio Grande Valley trading its designation of Special White-Winged Dove Area to the South Zone area. “Numbers-wise you will see an increase in white wings, you’ll see a marginal increase in mourning dove and you should see a pretty good increase in Eurasian collared doves also,” Bobby Thornton, executive director of the Texas Dove Hunters Association, said yesterday. Moving up the opening date for the regular dove season should help address complaints by South Texas wing shooters who often see dove numbers decline significantly later in the season as birds move out of the region. Thornton said his organization is continuing to work toward nailing down Sept. 14 as the regular dove season’s opening day every year. Hunting in Texas is big business, and estimates are its annual economic impact is around $350 million when all targeted game species are combined. Speaking of shotgun shells, Thornton says the state average is it takes six shells to put a dove in the cooler. “In some places, it’s probably more than that,” he said with a chuckle. Fishing licenses — except year-to-date licenses — also will expire at the end of the month and will need to be renewed. More than 2.4 million Texas fishing and hunting licenses are sold annually and all fees go to fund conservation efforts and recreational opportunities around the state. Hunters and anglers can purchase licenses online, by phone or in person at any of the agency’s 28 law enforcement field offices, at more than 50 state parks and at over 1,700 retailers across the state. When making a license purchase, license buyers can add a donation of $1, $5, $10 or $20 to help support the “Feeding Texas’ Hunters for the Hungry” program or the Veterans Commission’s Veterans Assistance Fund.